Mobile Service operator Uninor, Cheers Etisalat DB (Swan- Cheers Mobile), Uninor, MTS (Sistema-Shyam) Loop Telecom and some other operator finally paid penalties to the Department of Telecommunications (DoT) for failing to launch commercial mobile/telecom services on time. Earlier The Telecom Regulatory Authority of India (TRAI) was asked Department of Telecommunications (DoT) to cancel CMTS/UAS licences given to telecom operators including Cheers Etisalat DB (Swan- Cheers Mobile), Loop Telecom, Uninor, Videocon, MTS (Sistema-Shyam) and Aircel that have not met network roll-out conditions set by the authority. 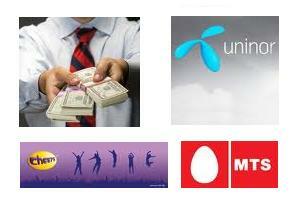 Uninor, the joint venture between Norway’s Telenor and Indian Reality major Unitech, had deposited the penalty as claimed by the DoT. The operator also said that various factors, including delay in clearances required for each site, new last minute pre-launch testing requirements and new equipment security clearance processes, came in the way of roll out and were beyond our control.The operator requested to the DoT to consider these in its assessment of penalty. CDMA Mobile service operator MTS (Sistema-Shyam Teleservices Limited) said the company has paid Rs.11 crore for imposition of liquidated damages towards roll-out obligations to the DoT. Etisalat DB Telecom (Cheers Mobile) also has made payments for Rs 9.9 crore as a penalty by DoT under protest.Some thier operators, including Loop Telecom and Videocon, are also facing the same action for missing the roll-out deadline. The Loop Telecom has paid the penalty of Rs 2.7 crore to the government for missing out network roll-out in the stipulated period. Earlier The Comptroller and Auditor General of India’s report revealed that most of new operators, who obtained the initial 4.4 Mhz spectrum in 81 service areas during the period Apr 2008 to Jan 2009, failed to roll out the commercial telecom services in any service area till Dec 31st 2009. The report also slamming the Telecom Ministry for irregularity and impropriety in giving licences to new players in 2008, causing a loss of a whopping Rs. 1.76 lakh crore to the exchequer. According to the CMTS/UAS licencing conditions, the licencees/operator were required to roll out the telecom/mobile services in 90% of service areas/circles in metros and 10% in district headquarters within 12 months of the date of award of licenees.